PES 2013 will undergo a second patch later this month, Konami have revealed. 1.02 will be released on November 29th and will implement a number of significant changes; including the removal of the black boots and forced auto-save features in Master League. * The transfer fee and contract fee shown when signing a player is different to the one shown in the breakdown of such costs. * Changes to the squad and the team funds were not reflected immediately when signing/releasing players or receiving gate receipts from matches played. * Sometimes the game would freeze when items obtained in Master League Online were used. * It was impossible to complete the "Long-pass" training when Pass Assistance level was set to either  or . * It was impossible to complete the "Manual-pass" training when the cursor was set to "fixed" when using Personal Data other than "no.1". 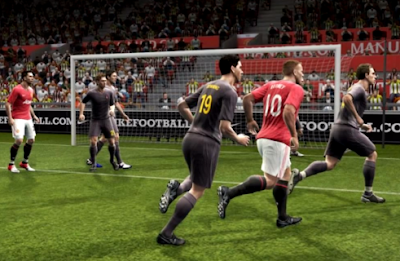 * Sometimes the game would freeze when importing PES 2012 data. This applies to cases where implementing the data would result in players switching to wearing boots which were issued in PES 2012 Data Pack 3. * When a new Data Pack was implemented, users were forced to restart their hardware as a message informing them of non-matching Data Pack versions would be displayed rendering some game features such as Master League Online, Competition and the Widget inaccessible. * Users can now choose to enable or disable the Auto Save feature in game modes including Master League and Become a Legend by selecting [System] then [Auto Save] in order. * Players will wear boots which are unique to them in both Master League and Become a Legend. Any editing done to player's boot settings will also be reflected. However, please note that this only applies to save data created after the implementation of this patch file. * Changes have been made to how teamwork levels between players increase. General improvements to other modes to improve overall gaming experience. 1. Customers can be paired with users they added to the Match Block List. 2. Sometimes, the bonus prize money earned after a Special match can be shown as being 0. 3. In Inter-Community Matches, customers are sometimes unable to substitute COM controlled players. 4) If you play a 2 vs 2 match in Ranking match, but then try to play Master league Online and any other one player online matches without deleting the guest user, no matchmaking will take place. 5) After matches, customers may be returned back to the Online Main menu. An error message stating that an unexpected problem in communications with the PES 2013 server is then displayed.